A seductive view from Cairanne. Book by 31 March for up to 30% off Chambertin stays in 2018. Sip a bubbly on the balcony at Merlot. 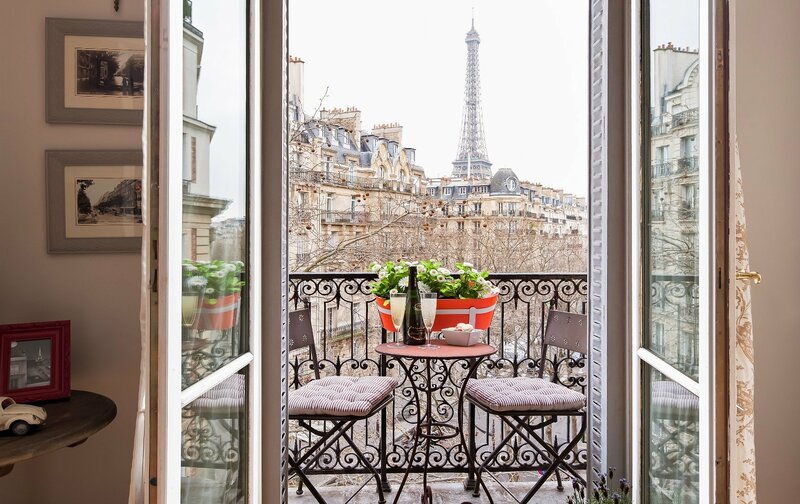 Enjoy postcard-worthy panoramas of the Eiffel Tower from your fifth-floor balcony over a bottle of bubbly at magnifique Merlot. Gaze to the right and you’ll spy the towering icon. This Left Bank stay in the 7th arrondissement suits small gatherings, sleeping up to six in two bedrooms. Handily, a contemporary Italian sofa in the living room converts to two extra twin beds. An elegant trad-modern affair, the apartment offers spacious living and dining areas. Champ de Mars park is directly opposite for romantic rambling or strolling by the river Seine. There are three large open-air markets nearby for stocking up on dinner supplies – or champers! 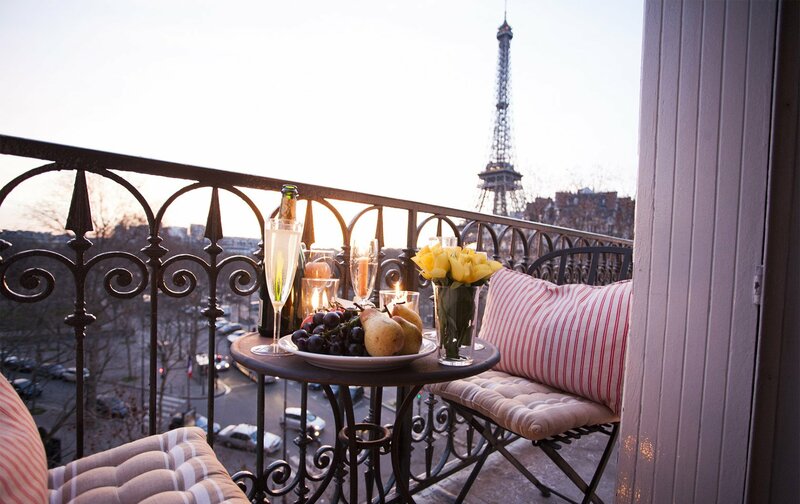 It’s all about the terrace at Cognac, where soul-stirring Eiffel Tower views go well with an actual cognac. On the sixth floor of an elegant building, the long terrace gazes over the rooftops of Paris. Access its seductive side tables and seats from two sets of French doors in the double living room. This retreat sleeps up to eight so suits group getaways. You’ll also enjoy panoramas of the Tower from the lounge and den, especially magical at sunset when the light show begins. Soak up views of the Invalides, Rodin Museum and even Sacré Coeur on a sunny day, plus the Arc de Triomphe. You’re just two blocks from the Eiffel Tower’s park. 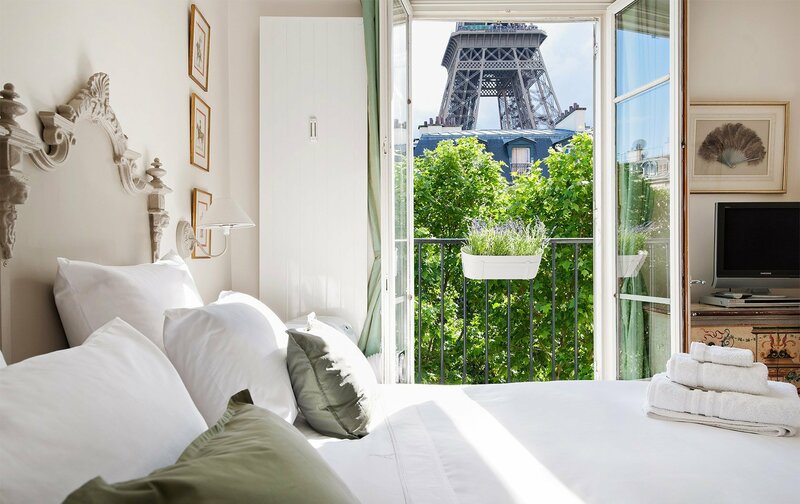 Breathtaking Eiffel Tower views from the Bergerac master bedroom. Twinkle, twinkle, little star… You’ll feel like you can reach out and touch the Eiffel Tower’s sparkly lights from the balconies of beautiful Bergerac. The mighty monument is also visible through French doors from the living and dining areas and master bedroom. Sleeping up to seven with three bedrooms and a sofa bed, this chic, neutral-hued number is a favorite for magazine shoots. 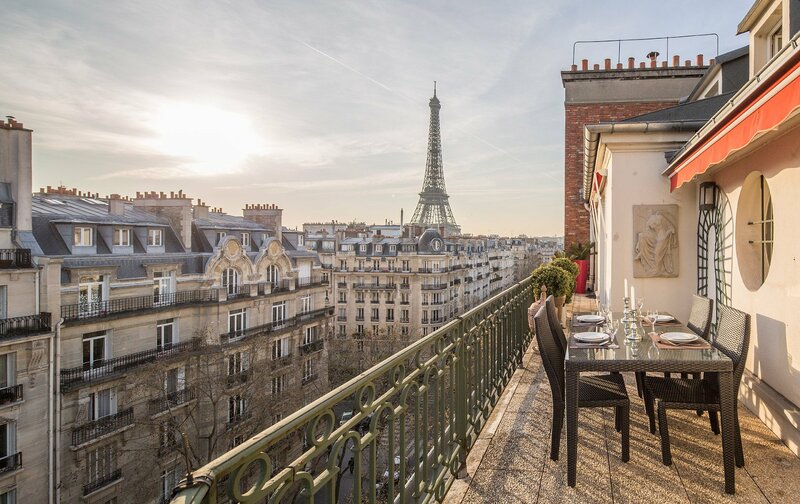 Alongside unobstructed Eiffel Tower views, the apartment overlooks Champs de Mars park. Pop down for a promenade around the sought-after 7th arrondissement. Then return to soak up those magical views over a glass of red. You don’t come to Paris to peer into a building’s internal atrium! Pop some champagne – or the question – at Lalande. 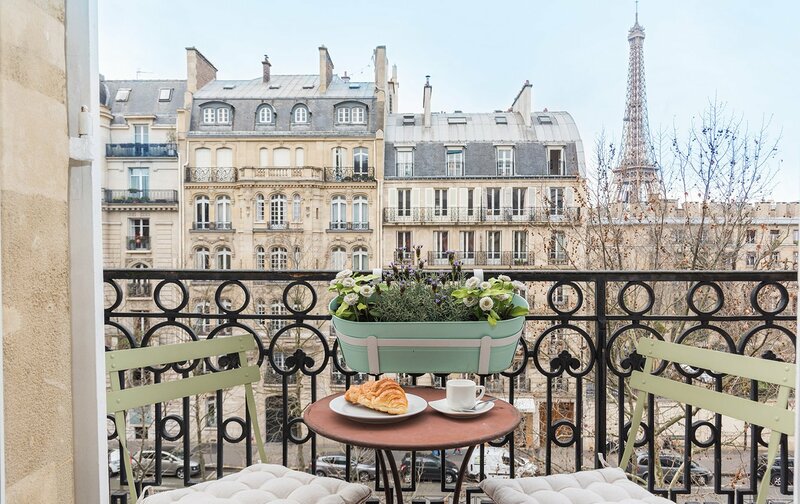 Perch on the pretty balcony of elegant designer apartment Lalande to enjoy dreamy Eiffel Tower views over the classic streetscape. The holiday mood will kick in straight away and you could only be in Paris! Named after the wine region, this neutral-hued, three-bedroom, three-bathroom duplex sleeps up to six on the Left Bank. 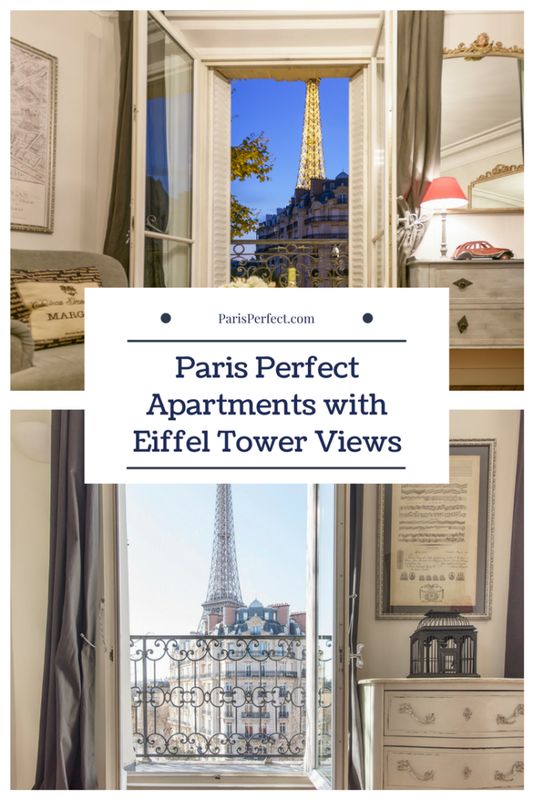 Set over the fifth and sixth floors of a period building, it offers direct Eiffel vistas from the dining area, den, and kitchen, or just gaze to the right from all three bedrooms. The narrow wraparound balcony comes complete with dinky side tables and chairs, ideal for popping a cork – or the question! Get up close to the Eiffel Tower at Viognier. 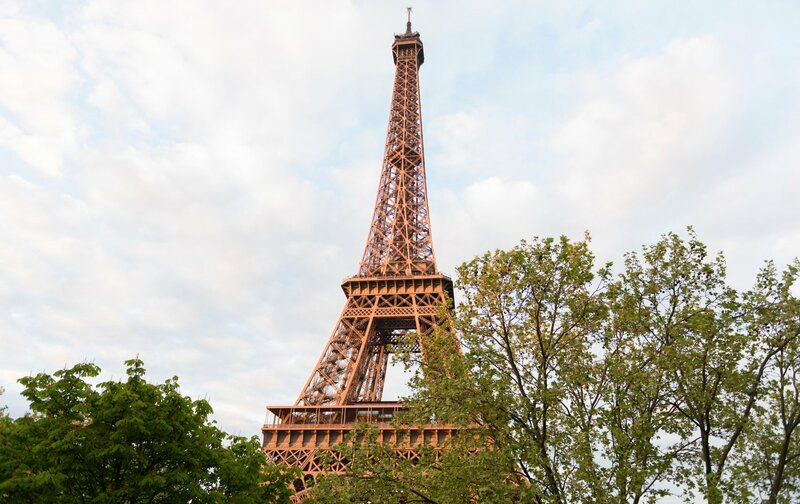 Get up close and personal with the Eiffel Tower at Viognier, which nestles under the coat-tails of the famous tower. Or at least as near as you can get without having to queue for entry! Admire so-near-you-can-touch it vistas from the master bedroom or spacious living and dining areas. This glamorous, indulgent stay sleeps up five, with two bedrooms and a flexible sofa bed that flips to a queen-size bed. Set in the Left Bank’s 7th arrondissement, this is one of the most romantic apartments in Paris. Toast your holiday with some illuminations alfresco when the tower’s light show sparks up at night (from sunset to 1am each evening, or 2am in summer). 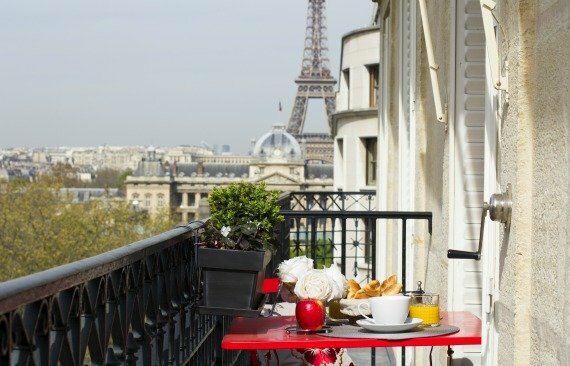 For more Paris Perfect stays with pleasing peeps of the Eiffel Tower, check out Beaujolais, Calvados, Chablis, Chateau Latour, Clairette, Margaux, Romanée and Saint Emilion, just some of our view-blessed getaways. PREVIOUS: Small Apartment, Big Living: Tiny Paris Apartment Transformed! NEXT: Why I Love the 7th Arrondissement of Paris! If You Feel the Same, Join the Club! Posted on Tuesday, March 27th, 2018 at 12:47 pm in Apartment Rentals. You can follow any responses to this entry through the RSS 2.0 feed. You can leave a response, or trackback from your own site. One Bedroom Apartment for Sale with Stunning Eiffel Tower View! 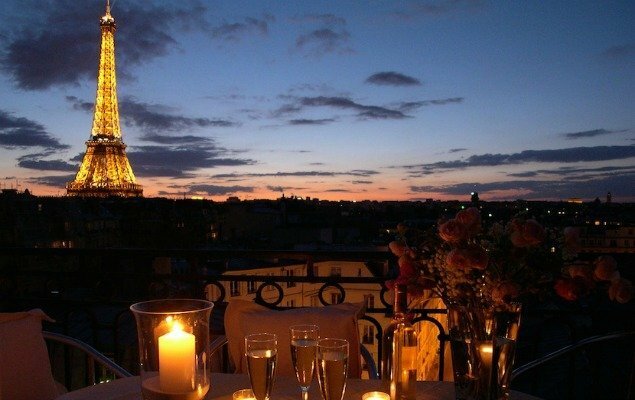 Breathtaking Views of the Eiffel Tower at the Jasnieres! 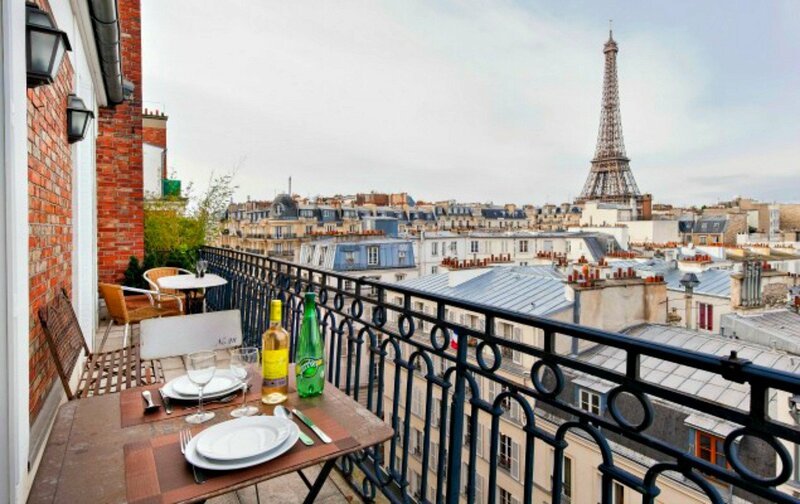 Gorgeous Paris Apartment with Eiffel Tower View for Sale! 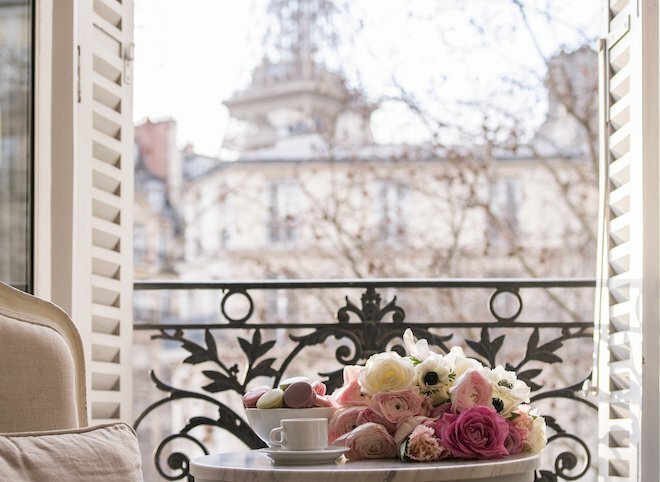 Our Top 5 Most Stunning Paris Apartment Views!